Could Nuclear-Renewable Hybrid Help Stave Off Greenhouse Gases? Bill Gates, who knows a bit about developing new technology, says that failure rates in green energy start-ups will be well over 90%. “This is a very complex set of technologies, and so we need thousands of companies to be trying these things to increase the odds that 10 or 20 companies will get to that magic solution,” said Gates at a conference in 2012. Given that, we can’t afford to reject any new idea out of hand, nor can we assume that we have already discovered “the holy grail” to future energy sources. Bill Gates also says we shouldn’t reject nuclear power as a key future energy source. Thus, it is worth considering an intriguing idea from MIT research scientist Charles Forsberg that suggests combining nuclear power with renewable sources in a hybrid design might provide a better match to the variable output of renewables than batteries. Writing in the November 2013 edition of the Energy Policy Journal, Forsberg describes a hybrid system to address mismatches between electricity production and customer demand in a nuclear renewable electric grid. Both nuclear and renewable energy are zero carbon sources. Currently, fossil fuel units are the most common generation source used to account for the variable output of renewables. Fossil fuels are easy to store, and fossil units can be ramped relatively easily. But all fossil fuels emit greenhouse gases. Nuclear units, which emit no greenhouse gases, are not currently well suited to pairing with renewables because they are not designed to ramp in response to the variable availability of renewable power. In his article, Forsberg describes a possible zero carbon grid designed around variable electric and steam output. In his design, nuclear units would remain baseload units, but they would focus on production of steam, not electricity. 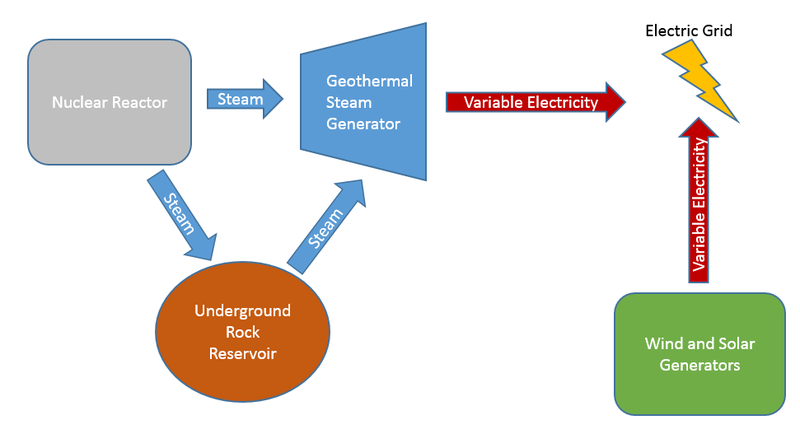 When electricity is needed for the grid, the steam is used to produce electricity in a geothermal steam turbine generating unit. But when renewable sources are producing plentiful electricity, the steam would instead be stored as heat in an artificial underground rock reservoir. The heat source would then be used to produce electricity at a later time. Does this sound fanciful? Well it certainly will take some time to develop. But when you consider the amount of nuclear power that either exists and/or is being constructed in some parts of Asia and the Middle East, there may be something to the idea. Research into nuclear hybrid systems is ongoing at institutions such as the U.S. Idaho National Lab, the Joint Institute for Strategic Energy Analysis as well as in various international coalitions. Results may or may not prove fruitful, but as Bill Gates points out, we need to keep trying various ideas to address our energy needs. 1 Response to Could Nuclear-Renewable Hybrid Help Stave Off Greenhouse Gases? There is another hybrid-nuclear approach that relies on a gas reactor creating compressed air for subsequent use by a combustion turbine. Basically a variation on the natural gas combined-cycle power plant, the hybrid-nuclear technology is powerful, efficient and very competitive. The hybrid uses nuclear and fossil fuels, including gasified coal. The hybrid is an ideal partner for renewable energy due to the large number of applications and highly flexible operating characteristics. See hybridpwr.com for additional information.